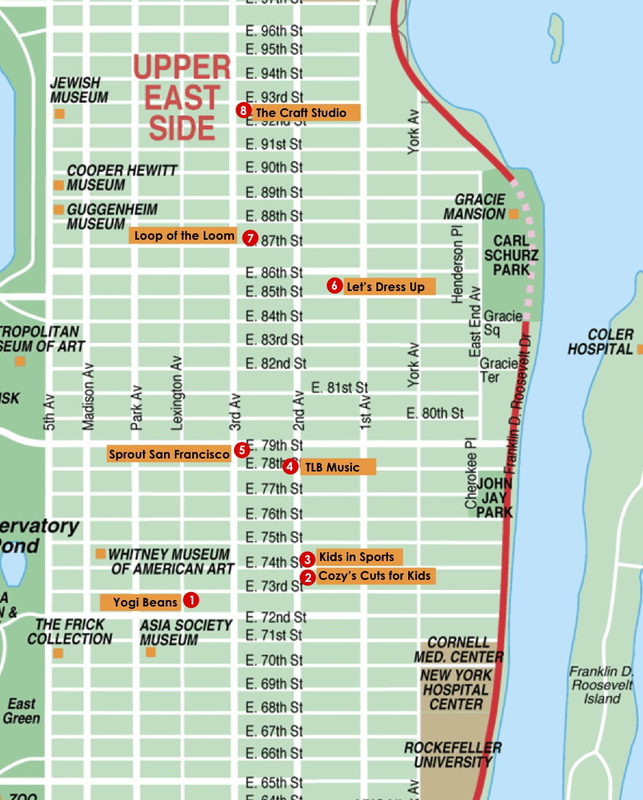 Our children’s music studio and playroom is located in the heart of the Upper East Side. We are surrounded by so many fantastic businesses that cater to families and in particular, young children. We put together a list of some of our favorite places and classes for kids. This gorgeous yoga studio offers yoga instruction in group, individual or “duet” classes. Their classes develop focus, posture, coordination, flexibility, and self-confidence. You can also celebrate birthdays at Yogi Beans! Cozy’s Cuts has long been the go-to place for Upper East Side kids haircuts. With cars for chairs, DVDs to distract, and a staff that caters to kids, getting a haircut for your little one has never been easier. Cozy’s Cuts also hosts “Glamour” birthday parties! Kids in Sports‘ program teaches children the fundamentals of Baseball, Basketball, Flag Football, Floor Hockey, Lacrosse, Soccer and Volleyball! They teach out of several other locations on the UES and also offer birthday parties and summer camps for kids. Music classes at TLB Music (formerly Three Little Birds Music) encourage the development of motor, language, social and cognitive skills while having fun. Teachers introduce toddlers to all genres of music and 20 classical and folk instruments. TLB also as an eco-friendly indoor playspace perfect for rainy, humid, or chilly days! Also offered: birthday parties and drama classes. This store has everything you need: toys, clothing, furniture, room decor, bedding and more. All items at Sprout are from eco-friendly companies, composed of organic or natural material! It’s the perfect place to find family-friendly gifts. Let’s Dress Up is one of the Upper East Side’s best places to host a play date or birthday party! Children dress up in shiny, sparkly, feathery dresses and knight costumes and choose accessories from the imaginative collection. Birthday parties include a tea party, nail polish, glittery makeup, and pictures. Loop of the Loom is the only hand-weaving studio in NYC! They offer several types of weaving classes for children ages 5 and up. Students learn how to make items like hats, bags, dresses, tapestries, and belts. Also offered: adult classes, special events, and workshops. At The Craft Studio, children express themselves with imaginative art projects. You can sign up for a weekly class, drop-in for some spontaneous creation, or celebrate a birthday here. Don’t forget to visit their toy shop! The Craft Studio also offers classes to go and classes for adults.